For Peter Kass and his John&apos;s Bay Boat Company, wood has been the material of choice for more than 25 years. If you grew up in the 1960s or &apos;70s, chances are pretty good your family boat was built of wood, or the boat in the next slip was. We had a 20-foot wooden Penn Yan and a 16-foot fiberglass MFG runabout - along with my brother&apos;s wooden Lightning - at the same time in the mid-&apos;60s, so ours was a fairly ecumenical outlook. And I grew up fishing on wooden boats. If you&apos;re a lot younger than I am, I&apos;m sorry you didn&apos;t have the rewarding experience of recreation aboard simple, reliable, low-cost and low-maintenance wooden boats. Juxtapose this with today&apos;s boats, many of which are built mostly to carry 500-amp stereo systems and torpedo-sized speakers aloft. This wood-centric youth pretty much set my outlook on boats in concrete, so a recent visit to John&apos;s Bay Boat Company in South Bristol, Maine, was a real kick. Pete Kass, who started the company in 1983 at the ripe age of 24, builds finely crafted cedar-over-oak, plank-on-frame wooden boats to 45 feet in a 50-foot shed with a railway leading from the double doors down to the water. 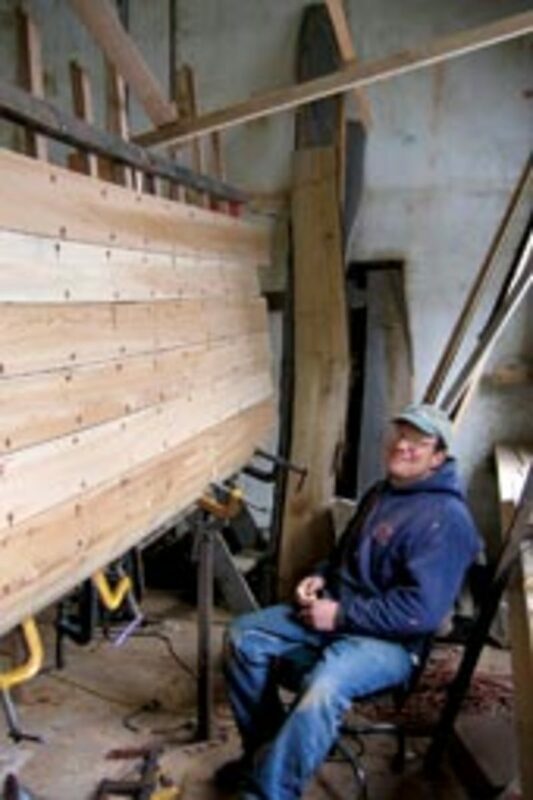 Out of high school, Kass apprenticed with boatbuilders in Virginia and Maine (including the Harvey Gamage yard), and he did a lot of repair work, learning from others&apos; mistakes along the way before setting out on his own. Prime land on the water was out of sight, even in 1983, but you could still buy backwater land on the cheap, and zoning wasn&apos;t the problem it can be now. It also was easier to add a business to a residential building permit. So Kass bought property around the corner from John&apos;s Bay and set up shop. Why even talk about wood when fiberglass boats are so plentiful? 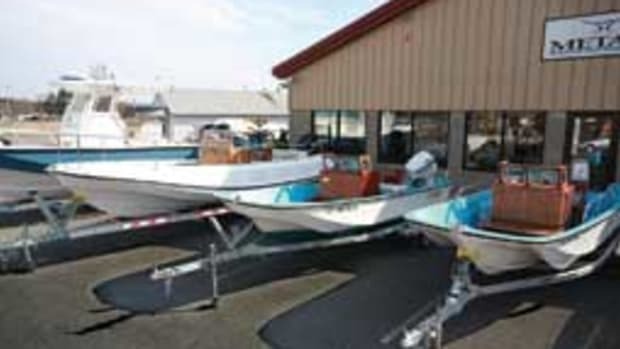 Jim Trefethen, in his book "Wooden Boat Renovation," makes some interesting points, noting that both fiberglass and wooden boats take a lot of work to keep in showroom condition, as all those mobile detailing trucks parked down at the marina testify. WoodenBoat magazine once published a cheeky article claiming that wooden boats actually require less money to maintain than plastic ones. Trefethen says keeping a glass or wooden boat in decent condition takes about the same amount of work, but the real difference is that the effect of neglect is much more drastic with a wooden boat, since the structure will deteriorate more quickly. This is a distinction I can relate to, since I&apos;ve owned both types. Trefethen also points out that although neglected wood rots, fiberglass delaminates, tabbing comes loose from hulls and bulkheads, water-soaked balsa core creates a horror show, bottoms blister, and so on. In a future story, I&apos;ll tell you about the 43-footer Columbia, a Phil Bolger-designed charter fishing boat I grew up fishing next to out of Rock Harbor on Cape Cod, Mass. She was built in Provincetown, Mass., in 1964 of cedar-over-oak (like Kass&apos; boats, only lighter) and is now getting her first real overhaul - after 46 years. And there&apos;s no rot to be found. I can think of a lot of fiberglass boats 10 or 15 years younger that have been lugged down to the dump. The bottom line is that a well-built wooden boat will last as long as any fiberglass boat with reasonable care throughout its life. Kass says one of his boats will cost a little more to maintain than a glass boat, but the commercial fishermen will make it up in one windy day offshore when those corky plastic boats have to stay at the dock. He believes the reason for the extra cost isn&apos;t that wooden boats actually take any more work to keep up. Rather, the skill level at yards has gone down and so has the proficiency of a yard hand who only paints the topsides on wooden boats once or twice a year. 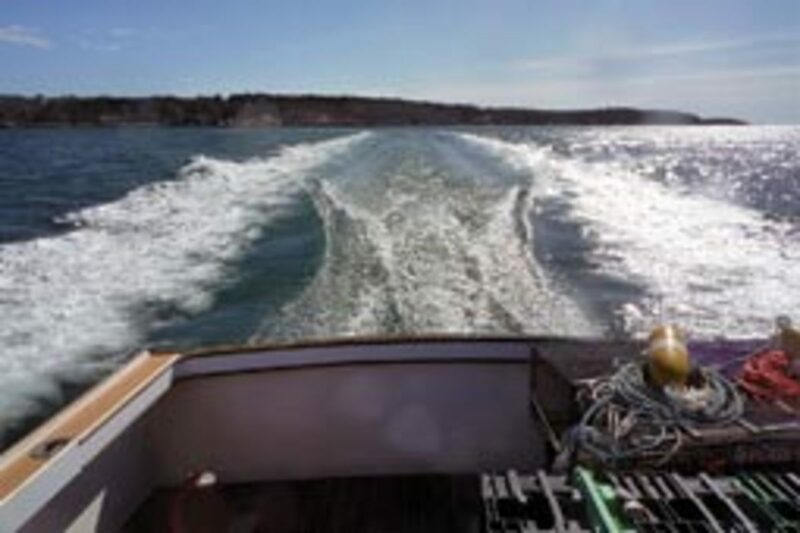 Fortunately for John&apos;s Bay boat owners in Midcoast Maine, Kass works on a good number of his own boats every year - typically a boat a week from April through July, with the commercial boats getting their turn when lobsters are shedding and not eating for four or five weeks around June. Kass says the average cost for annual maintenance on these boats is less than $4,000, and it doesn&apos;t vary much with age if the boat is kept up. As with fiberglass, the trick is to find a wooden boat that is built of the finest materials and put together using the right process so it lasts. Kass has built 62 boats from 24 to 45 feet since 1983, and they&apos;re all going strong today, many of them used thousands of hours a year, year-round. 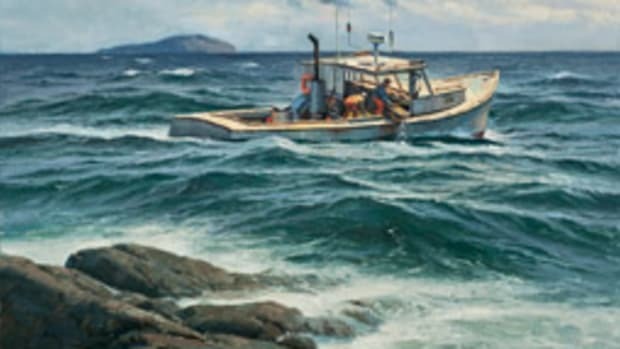 Most are ordered by commercial fishermen, old salts who swear wooden boats are more comfortable in a seaway, quieter and altogether kinder and gentler for their occupants. The physics of the weight distribution in a wooden boat support that, as we&apos;ll see. They appreciate that wood is a natural thermal and acoustic insulator, and that it absorbs vibrations nicely. When the bottom soaks up upon launching, it&apos;s heavier than a fiberglass boat, but trading a couple of knots for the extra comfort wood delivers isn&apos;t even worth discussing. A 78-year-old commercial lobsterman who had a John&apos;s Bay boat built 20 years ago tells people that Kass saved his life. He was deteriorating physically, tired easily and had bad knees. Then he ordered a John&apos;s Bay wooden boat and soon felt like a younger man again. 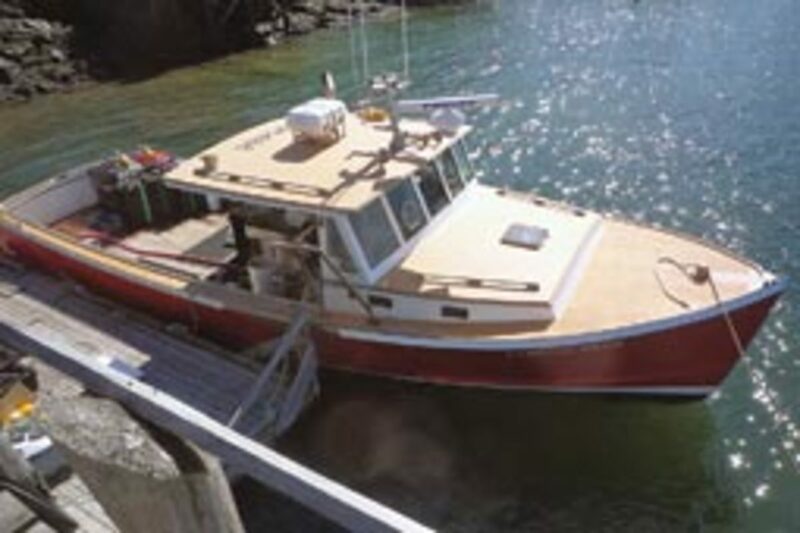 A number of Kass&apos; boats have been sold to summer Maine residents who like the appeal of wood - the aroma down below, the fact that the boat came from trees and not petroleum, the ability to customize not only the cabin layout but the hull design and deckhouse arrangement, the whole concept of owning a wooden boat. For them it&apos;s like owning fine furniture; you can be perfectly comfortable sitting in an $8.99 plastic Kmart garden seat, but the teak Adirondack chair is simply more rewarding. Kass designs all of the boats he builds, starting with a half model he carves and then takes the lines from using digital calipers. He then lofts the keel, stern (transom) and temporary molds, which become the framework around which the boat is built. Starting at the bow, the boat&apos;s backbone - using white oak for its strength, stiffness and rot resistance - is made up of a stem and forefoot held together by a knee and then the keel. The stem is out of the water and susceptible to rot from rainwater, so this piece is sawn from the rot-resistant sapwood. The top of the stem is also epoxied to prevent water intrusion. Back aft, the hull backbone is made up of several sections. The deadwood creates the shaft angle, a shallow and efficient 7 degrees on most of Kass&apos;s boats. The shaft log, which when finished is a long timber with a hole for the propeller shaft down the middle, is made in two pieces, with the bottom and top half of the hole sawn and chiseled out of each and then joined. A jib piece fills the gap between the shaft log and the horn timber, which extends back to the transom. Kass doesn&apos;t use a stern post, as he is able to fair the aft end of the keel sections more effectively for smoother water flow to the prop without one. 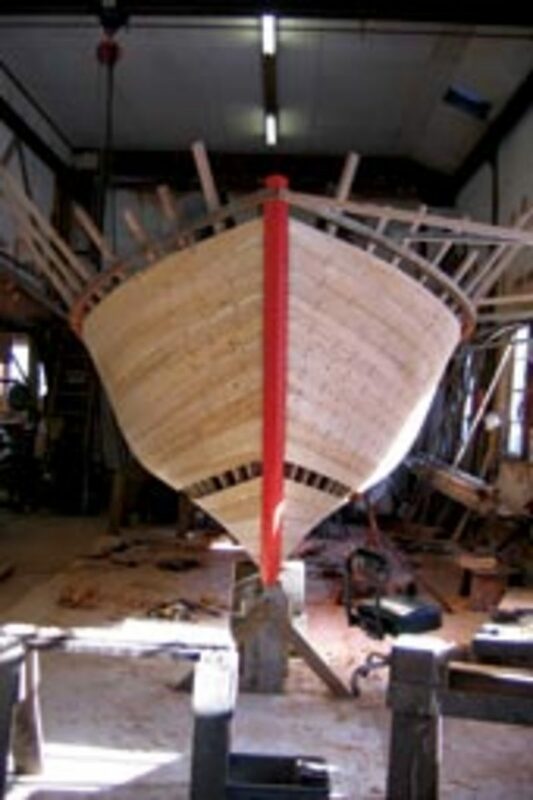 A rabbet is chiseled out of the stem and keel to accept the planking - a real art to do well since the angle at which the planks meet the stem and keel constantly changes - and sockets are chiseled out to receive the ribs. The oak keel sections are painted with red lead paint as a preservative, stacked together to form a single unit and tied together using silicon bronze bolts from top to bottom. On a 40-footer, there are 30 keel bolts (5/8 inch) in all. The keel is then turned upright, set in place on the shop floor and braced in position. The next step is to set the transom (or stern, in true boatbuilder speak) and molds up on the keel; these define the shape of the hull in cross section. The transom becomes part of the finished boat, but the molds are temporary. 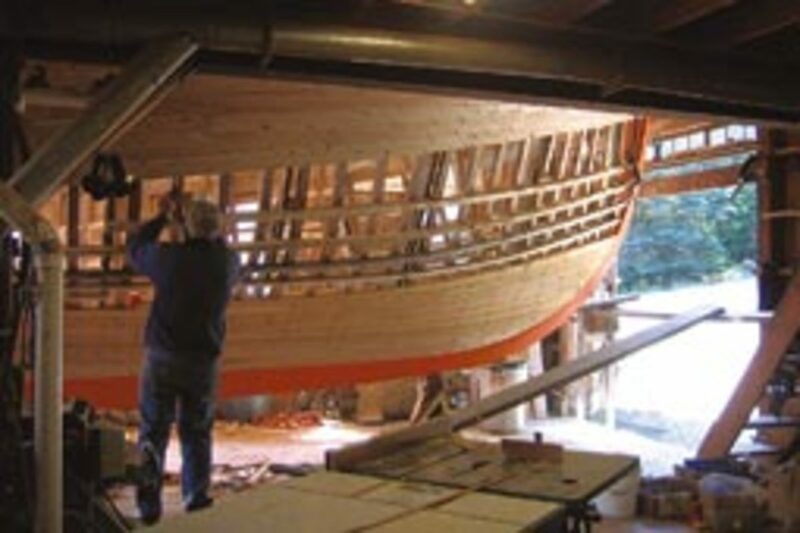 Once the molds and transom are braced in position, temporary battens (or ribbands) running fore and aft like the planks are screwed to the stem, molds and transom every 6 inches, closer near the keel where the planks twist more to follow the curvature of the hull. The battens in turn define the shape of the ribs. Once the battens are in place, the floor timbers go in. These are 2- to 2.5-inch-thick oak, varying in depth from 8 to 24 inches, which span from one side of the hull to the other across the keel. The floor timbers essentially hold the two sides of the hull together and help to hold the hull&apos;s shape, especially if there is reverse curvature due to built-down (or hollow keel) construction. They also hold the engine beds and fuel tanks. 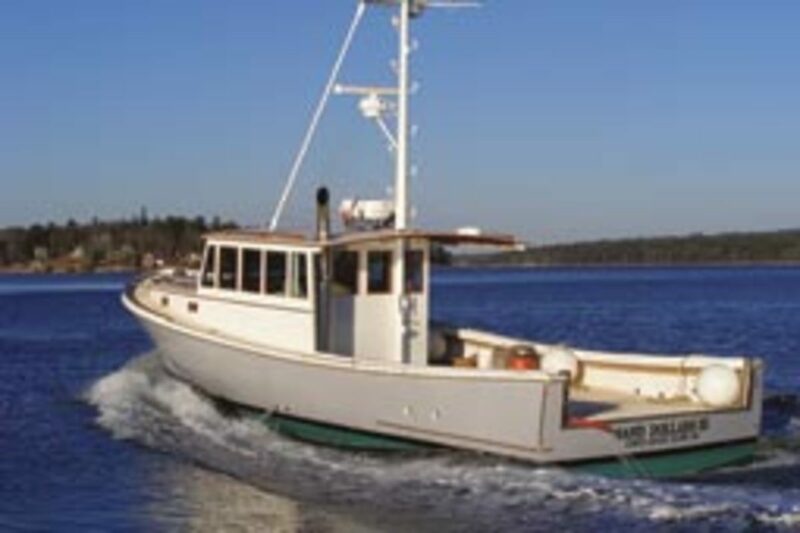 Of the two types of Maine lobster boats, the built-down hull is stronger, according to Kass, while the skeg design offers more lifting surface, which extends all the way to the garboard at the keel. Ribs are steamed for an hour per inch of thickness after they&apos;ve reached temperature, which takes about 30 minutes. (The steam stops condensing on the oak when it warms up.) Once the rib comes out of the steamer, one person sticks it in the keel socket and a second worker grabs the other end and forces it tight against the battens - working as quickly as possible. Clamps are used to hold the rib against the battens. Pilot holes are drilled, and 1/4-inch steel lag screws fasten the rib against the battens from the outside. This process continues until all the ribs have been steamed, bent into place and fastened securely. Ribs that have very tight radiuses, especially at the keel in built-down boats, are solid for the first 5 feet and then ripped in half at the bend, with the inner layer cut thicker so there&apos;s more meat to fasten to. It&apos;s important to get the ribs right, since the cedar planks aren&apos;t stiff enough to work irregularities (hills and valleys) out of the oak framing. The next step is cutting the cedar planks to fit and fastening them to the ribs. Kass buys his oak in Connecticut, which has a longer growing season than Maine, and the cedar comes from coastal Maine. "A guy with a mill Down East in Jonesboro builds cedar homes and he saves the best wood for me," says Kass. "If there are any black knots in it, we bung it on both sides before it goes into the boat." Kass has two teams going at once when planking, one starting at the sheer and the other at the garboard, with the battens coming off sequentially as the planking is applied. Most of the spiling - shaping the width of the planks so they match up without being too wide or too narrow - takes place below the waterline so the topside planks can be shaped to have seams that are pleasing to the eye. Otherwise, the sheer strakes and abutting planks would terminate abaft the bow and make the boat look like a real hatchet job, since the distance from the keel to the sheer varies from bow to stern (it&apos;s greatest in the middle section of the hull). If you lay a plank on a table, it would be curved from one end to the other so that when pressed flat against the ribs, it takes its natural place between the sheer and the keel. This means that the sheer strake and the next couple of planks below are the widest so they look right. This is due to the hull&apos;s flare and shape forward eating up a lot of plank width. Kass says a good man can hang a strake a day using 1-1/4-inch planking, up to 8 inches wide on the biggest boats. Since the 24-footer in the shop on my visit is the 62nd boat Kass has built since 1983, I imagine he&apos;s pretty good at it by now. Planking thickness varies; it&apos;s 1-1/4 inches on the 42, 1 inch on the 36, and 7/8 inch on the 24. Framing spacing, however, is the same on all of the boats at 10 inches on center, as it stiffens up the boat consistently. On one boat Kass knew was going to be ridden hard and put away wet, he went with 9-inch centers from the main bulkhead aft and floor timbers between every rib instead of every few ribs. That boat has been abused for 16 years and is still going strong, despite its owner&apos;s best efforts. The planks are fastened to the ribs with silicon bronze screws using Fuller tapered bits to drill out the holes with a 1/4- to 3/8-inch countersink for the bungs, which Kass&apos; wife, Nina, was making for the 24 when I visited. The bungs are dipped in epoxy, hammered in place and then cut off with a disk sander prior to fairing the hull. With the hull planked, bilge stringers are installed to stiffen the hull halfway between the sheer and keel, running from the stem back to the large floor timbers abaft the engine beds. A sheer clamp, made up of one piece of 1-by-5 laminated over another, is shaped and fastened to the hull at the gunwale inside the ribs to strengthen the hull at the rail. It takes an 18-inch-wide plank to create the 5-inch-wide sheer clamp because of the hull&apos;s curvature. "We order the lumber with a lot of sweep in it," says Kass. Platform (deck) clamps are then bolted to the inside of the hull side aft; these support the deck while further stiffening the hull. The deck frame, also of white oak, is built next, along with the engine beds. Red oak is used for the engine beds because it doesn&apos;t check as much when exposed to the engine&apos;s heat. "Red oak is more porous and less dense, and it&apos;s less impervious to rot, but that&apos;s OK since it stays dry below the engine," says Kass. With the fuel tank and engine in place, the platform (cockpit deck) goes in as soon as possible so it can serve as a working surface. "We put the chop saw, table saw and saw horses right up in the boat so things go quicker," says Kass. The cabin trunk is made from a single layer of 5/8 or 3/4 plywood, depending on the size of the boat, or two layers of 1/2-inch, $200-per-sheet Lloyds of London-certified plywood. The framing, which is varnished and visible from inside the cabin, is mahogany. The cabin and wheelhouse roofs are two layers of 3/8-inch plywood epoxied together, and they come with Formica facing so they are finished and easy to clean overhead. Then the trunk cabin and wheelhouse tops are fiberglassed to help prevent the freshwater rot that used to destroy wooden boats from the top down. The sides of the wheelhouse are solid mahogany, which holds paint very well, and all the joints are glued. Windows of 1/4-inch laminated safety glass are set into rabbets in the mahogany, with teak strips holding them in place. PVC rubrails are durable and low maintenance, and they&apos;re capped with 1-inch brass half oval, while thicker 3/4-inch half round is used at the stem for those slight docking miscalculations. Once the hull is planked, bunged, planed and sanded, the seams are caulked with cotton, not oakum, which Kass says is used for big boats or when trying to save a disaster. He is very careful with the seams, making sure no daylight can be seen through them. A 1/8-inch caulking seam is cut 2/3 of the way in, so the inner 1/3 of the plank should be tight. After the cotton is rolled in with a caulking wheel (think pizza cutter), the seams are primed and painted, using red lead below the waterline. The result is a boat that leaks little, if at all, when swelling up upon launching. Now an important lesson in painting. "The primer used above the waterline is just the finish paint thinned down so it penetrates," says Kass. "The sanding primers make your life easier initially, as they fill and sand easier, but the paint is too soft and doesn&apos;t last as long. With a primed boat we see more paint failures, often requiring the hull to be wooded [sanded bare] to correct the situation. ... We&apos;ve never had to wood a boat, even the ones built in the early &apos;80s." Kass&apos; crew paints the topsides with five coats of Epifanes enamel, and each year afterward they need only a light sanding and one coat unless abused to an unusual degree. "Maintenance on these boats is all from the rail up," says Kass. "Two of us could sand down one of our 41-footers using 120 grit paper in three or four hours. Then we&apos;d do a little puttying, cleaning up the nicks and then give it a coat or two at the most if there&apos;s a lot of wear, with a very light sanding in between." Kass says the bottom gets one coat of antifouling over the red lead when the boat is built and then annually thereafter. "The bottom takes the same maintenance as a glass boat," he says. "We can paint [an entire] 41-footer from start to finish in 15 to 20 hours a year." A quick comment on the molds: One of the advantages of building a wooden boat is that you can change the hull design easily, since it&apos;s one-off construction. 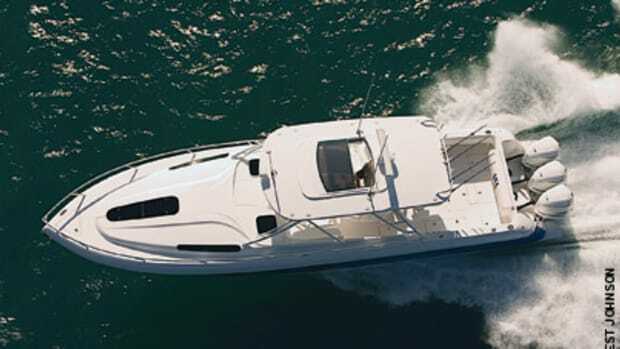 Say you want a finer entry for a better head-sea ride, or a fuller entry so you can carry more weight forward, or a wider transom to add load-carrying ability aft. Just tell Kass what you want and he&apos;ll carve a half model and let you look at it for a couple of days. He then pulls the lines, makes up a table of offsets and marks off and cut the molds. He gave a half model to one owner who kept it for a week, and he might have kept it longer but his wife told him he wasn&apos;t bringing that thing to bed. Kass can vary the height of the deck to create the right amount of coaming height to suit the owner (higher for taller customers). The hull sheer can also vary to accommodate the interior rail height, allowing the deck to be precisely as high off the water as the owner wants. 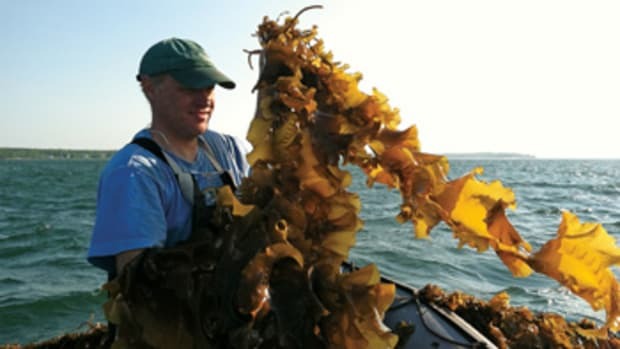 (Commercial fisherman can be very particular about the distance down to the water.) A fiberglass hull out of a production mold is locked into a particular hull shape and freeboard. Below the waterline, Kass favors deep gears and large wheels for their power and low-speed responsiveness. 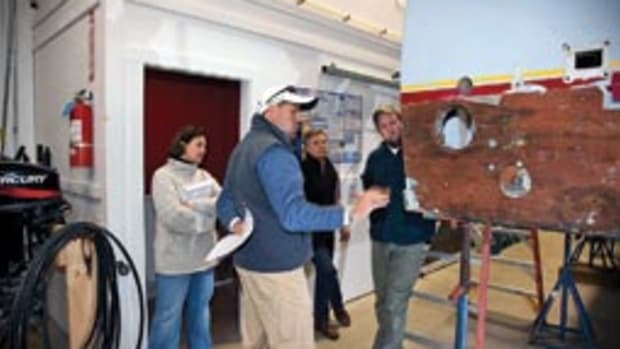 He&apos;s been using 1/2-inch stainless plate for his rudders and they have horizontal stiffeners that also act to keep the water from spilling off the rudder edges, adding lift for improved steering. We took a ride on one of his 42s with a 650-hp Volvo, and the boat responds emphatically to the clutch at idle speed (no throttle bursts needed most of the time). It also turns in nearly its own length and will back to port or starboard without trouble, even downwind, which is unusual for a single inboard boat. The rudder step is made of copper nickel, which doesn&apos;t erode as quickly as silicon bronze would in the prop wash. The boat came up on plane easily with no discernable hump - she just slides right up on step like a planing pontoon boat. 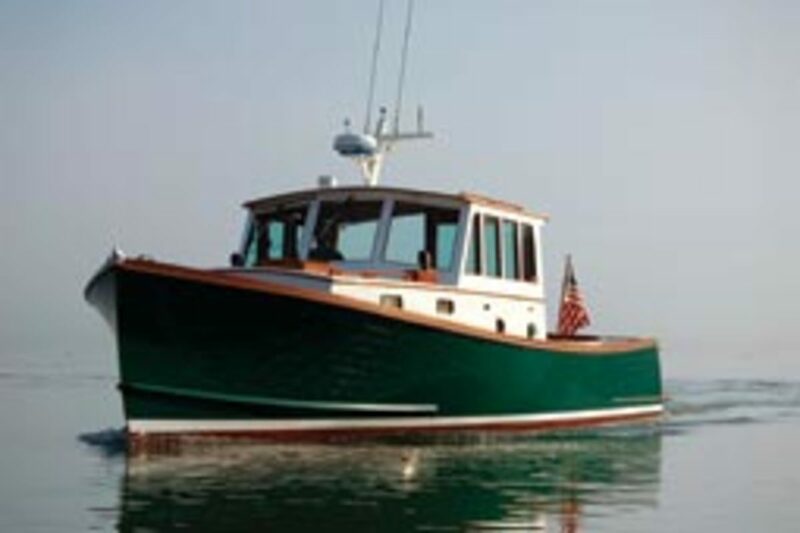 Wooden boats like a John&apos;s Bay are worth serious consideration whether you work or play on the water. "You can certainly count on 20 absolutely pain-free years," says Kass. "When it&apos;s 40 years old it may need refastening, but we&apos;ll have to wait and see, as our oldest boat is 27 years old with no real signs of age yet." Looking at the physics of their behavior in rough water, these wooden hulls are heavier than most fiberglass boats, and the way the weight is evenly distributed through the hull surface will impact not only its reactivity in up and down motions (heave), but also rotational motions (roll and pitch). That&apos;s because the distribution of weight determines the hull&apos;s gyradius, not the location of the center of gravity. The extra weight distributed around the perimeter of the hull, along with the heavy oak keel, certainly influences rotational motions, which in turn impacts accelerations in all directions and, therefore, the seakindliness of the boat offshore. In other words, the old timers are on to something, assuming the hull shape is a good one for its intended use and speed to start with, as these boats are. Practical issues aside, there&apos;s the pure aesthetic appeal of wood, a material that was once living. Dave Brown&apos;s family has summered in Maine for 100 years. When his grandfather unexpectedly sold his boat, it was up to Dave to fill in the gap with a new one. He met Kass and explained what he would do with the boat, and Kass recommended a 28-footer. "Pete was great to work with, very open to our ideas," says Brown. "It was a magical, emotional experience watching the boat being built. We all pitched in. My sister did all the bunging, my cousin painted the windshield, and the kids helped - if that&apos;s the word - with the painting, too. It&apos;s a great boat, just perfect for us. People come over to look at it all the time." The John&apos;s Bay 24 would cost around $70,000, nicely finished as a family boat with a 70-hp Yanmar diesel, representing 800 to 1,000 hours of labor. A 38 out on the railway was going to be finished to yacht standards with a flybridge, teak cockpit, enclosed wheelhouse, upscale accommodations for four with lots of brightwork, a head and shower, and powered by a 490-hp Cummins diesel. Price is $450,000, with about 5,000 hours labor in it. The same 38 finished as a lobster boat with the Cummins, a pot hauler and V-berth would be priced at $225,000, with 2,200 hours of labor. The lobster boat version would come in at about 4,000 pounds lighter than the yacht, which gives an idea of how materials and amenities can affect a boat. Kass says you can expect to spend a little more time keeping his boats in great shape, but that&apos;s not much of a price to pay given the breed&apos;s other advantages. If I were in the market, I would seriously consider one of these boats. 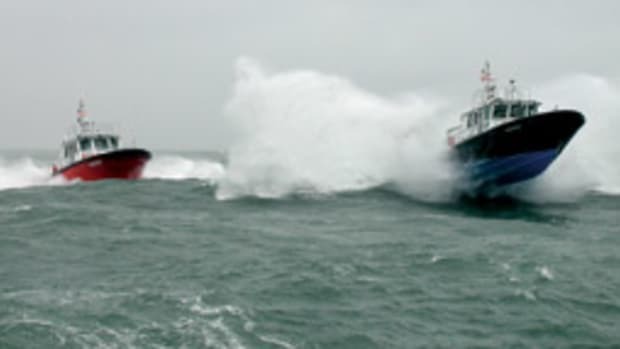 It&apos;s what I grew up in and feel comfortable being aboard, especially in heavy weather. 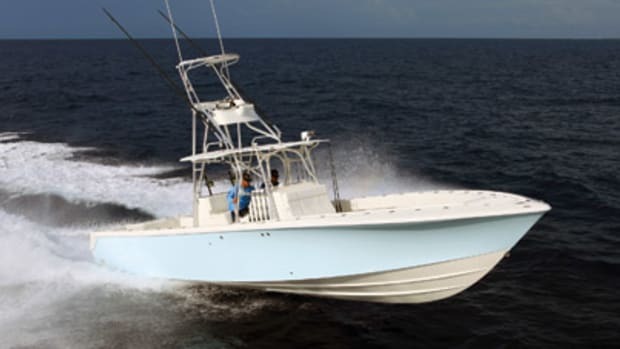 Along with their ability to be customized and their rugged practicality, these are also some of the most beautiful boats on the water, real head-turners. That&apos;s a pretty convincing rationale to head up to John&apos;s Bay. John&apos;s Bay Boat Company, South Bristol, Maine, can be reached at (207) 644-8261, or visit www.johns bayboat.com.